Nowadays it is easy to get flights to Indonesia. There are various airlines you can choose: either Indonesian airlines such as Garuda Indonesia Airways, Lion Air, and Mandala, or global airlines such as Singapore Airways, Air Asia, Lufthansa, KLM, Emirates, Malaysia Airlines, Qantas and many more. Our main international airport is Soekarno Hatta International Airport at Cengkareng, several kilometers western Jakarta. Hence, its nickname is Cengkareng or CKG if you see the band in your luggage. You also can request Visa on Arrival in this airport. If you fly with Garuda Indonesia Airways, they provide the Visa on Arrival form during the flight so you can speed up the process. But, before you do that, check whether you are eligible for Indonesia Visa on Arrival. Other major cities and tourist destinations in Indonesia such as Surabaya, Bandung, Jogjakarta, Denpasar, and Medan have international airport too. Therefore, if you intend to visit Sunda, you can fly either to Jakarta or Bandung. The name of Bandung international airport is Husein Sastranegara. 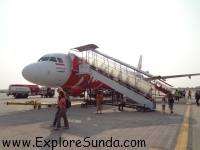 It is smaller in size, but it has direct flights to Singapore and Kualalumpur, Malaysia, served by Air Asia. 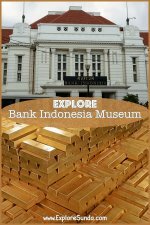 If you need more information on how to travel to Bandung, please check Bandung Travel Guide. Whenever I travel by plane, I always try to find the cheapest flight available, without ignoring safety. Over the years I learned that there are two kinds of cheap filghts: low cost carrier and connecting flight. There are several low cost carrier operated in Indonesia. Among them are: Air Asia, Citilink, Mandala Airlines, and Lion Air. As low cost carriers, they offer several promotion programs every year. So, if you plan ahead of time, you can save a lot. But, once you buy the ticket, you can not make any changes, or it will be very costly to change it. On the other hand, the airlines can change the schedules and we must follow the new schedule. So, think wisely whether the low price is worth your time or not. 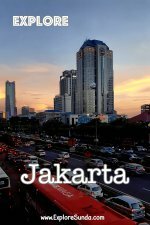 The next option to get cheap flight to Indonesia is to find a connecting flight. For example, once I flew with Lufthansa from Jakarta to Bangkok. It was the cheapest flight because Lufthansa wanted to fill in the empty seats between Jakarta and Bangkok, since Bangkok was a transit hub only while the final destination was Frankfurt. The drawback of this kind of flight is inconvenient time of arrival, in my case I arrived at midnight. 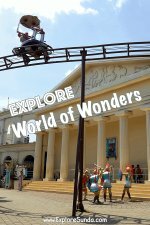 The easiest way to buy this type of ticket is to shop around between several travel agents and ask for the cheapest ticket to your destination. But always remember to check whether there is any transit and how long the transit time will be. Sometimes it is not worth to trade off cheaper ticket with long transit time. The question is: which type of flights to Indonesia do you prefer?